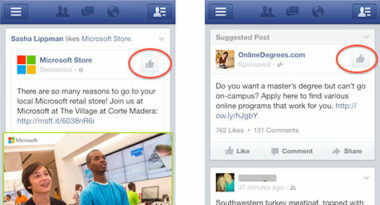 Facebook is trying to give mobile ads a friendlier face with two improvements on popular features. The first involves the “likes” of the mobile news feed, while the second regards the look of mobile app install ads. While these changes are relatively minor and more aesthetic than anything, InsideFacebook.com gave specifics on the social tweaks. First, iOS users will notice a brand-new “like” icon when accessing their news feeds from their mobile devices. Second, they will see more aesthetically pleasing mobile app install ads. These new mobile app install ads now have a subtler “Suggested App” header rather than an intrusive banner image and call to action of the previous ads. These changes appeared after the latest Facebook iOS update and are reportedly only for iOS operating systems, but their acceptance is likely to lead to a rollout for Android devices. To learn more about leveraging Facebook mobile ads in your mobile marketing strategy, contact MDG Advertising. MDG Advertising, a full-service advertising agency with offices in Boca Raton and New York, NY, is one of Florida’s top integrated marketing agencies. Our 360° approach uses just the right mix of traditional and digital marketing to reach your advertising goals. While some industries may fare better in print and others online, we strive to create a balanced approach, where traditional, social media, digital, and mobile marketing efforts support each other and your message is tailored to the medium. Our core capabilities include branding, logo design, creative, digital marketing, infographic development, integrated media plans, award-winning print ads, radio and TV advertising, online video, Web design and development, email marketing, social media marketing, and SEO. View some of MDG Advertising’s social media marketing work.